Booker T. Washington was one of the leading figures in the charge to educate freed slaves during the reconstruction era. Being a free slave himself, he believed that the key to African Americans’ future success was through learning practical skills. Though his emphasis on manual skills as the ticket to advancement for his race drew criticism from those favoring a more balanced education for African Americans, it’s evident that his approach was perhaps better suited to the American social climate of its time. But Booker T. Washington’s ceaseless, pioneering efforts helped to ease white America into a greater acceptance of their fellow Americans. George Washington Carver too was inexorably linked with slavery (his parents were former slaves,) and like Washington, did not let that fact keep him down. He was quite intelligent, and after a boyhood growing up learning about plants and botany, he pursued that field in higher education. He eventually graduated with a B.S. from the Iowa State College of Agriculture in 1894. He used this degree to great affect, discovering numerous uses for peanuts, soybeans, and sweet potatoes; crops that were once considered worthless. His research helped many farmers in the south deal with problems such as soil depletion and the boll weevil, which destroyed the cotton industry. 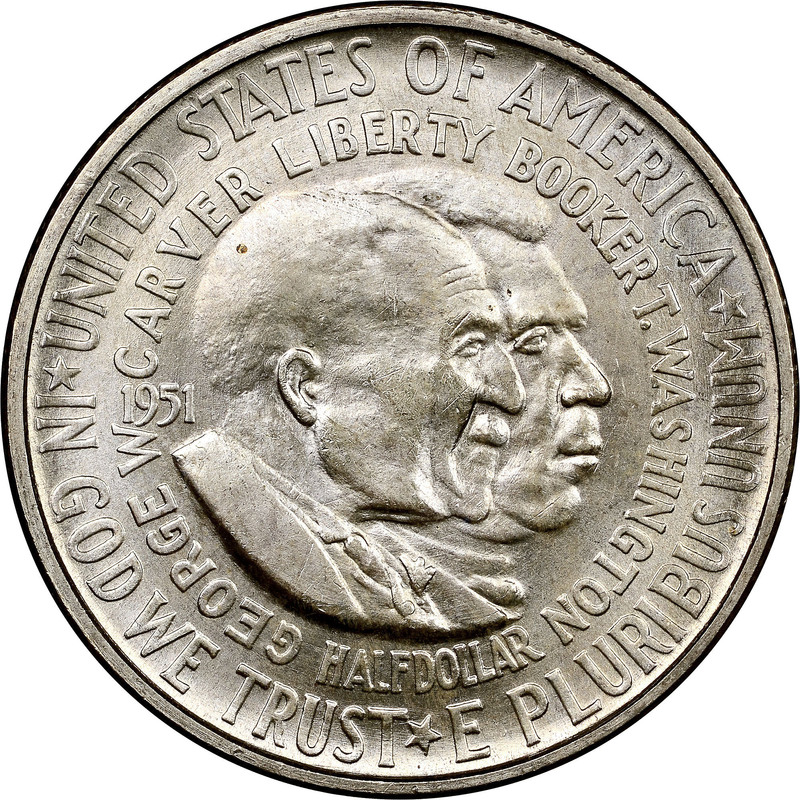 The George Washington Carver National Monument Foundation spearheaded the push to commemorate Carver’s life with a commemorative coin in 1951. A bill passed on September 21, 1951 authorized the mintage of up to 3,415,631 coins. This odd maximum mintage number was derived from the remaining 1,581,631 Booker T. Washington half dollars which could be melted and struck as Washington-Carver coins plus the unused quantity 1,834,000 earlier authorized for the Booker T. Washington coins. The design for this coin was created by sculptor Isaac Scott Hathaway, who had performed the same work for the B. T. Washington issue. 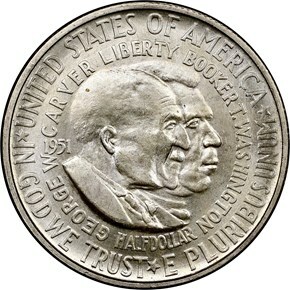 The Washington-Carver Half Dollar depicts conjoined busts of the two men facing right, with Carver in the foreground. Their names are arranged in arcs around their busts, the names divided above by LIBERTY and below by the value HALF DOLLAR. Framing the periphery are the legends UNITED STATES OF AMERICA above and IN GOD WE TRUST and E PLURIBUS UNUM below. If this sounds overly congested, it is, and the pitiful little date of coining is wedged uncomfortably between this lettering to left of Carver’s portrait. On the reverse is a map of the continental United States. For those coin buyers who might not recognize it, the letters U. S. A. are superimposed atop it. 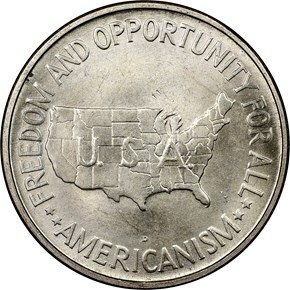 Around the periphery are the phrases FREEDOM AND OPPORTUNITY FOR ALL above and AMERICANISM below. 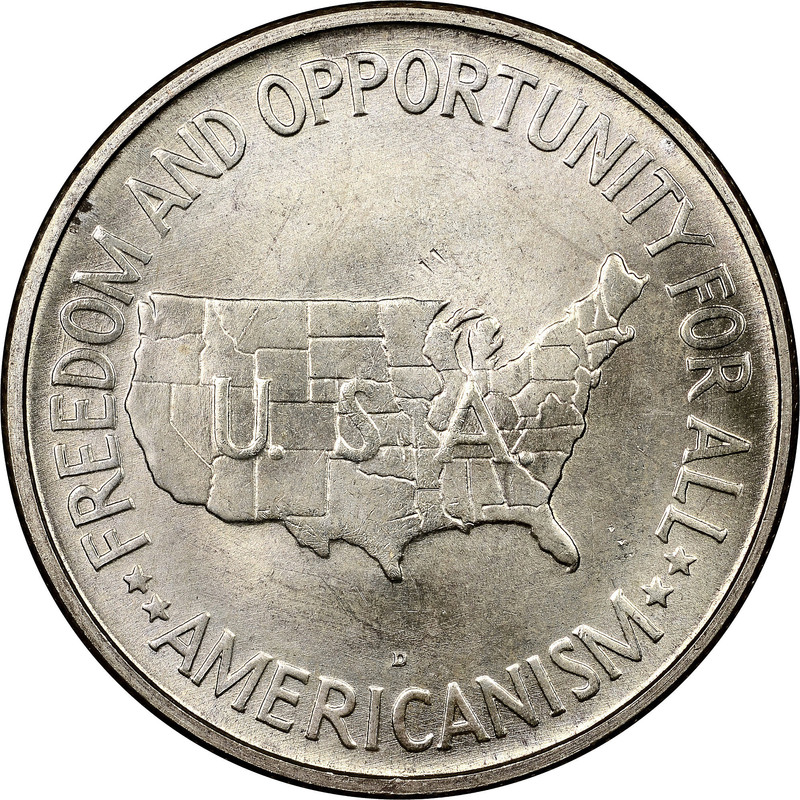 For coins minted at Denver and San Francisco, their mintmark letters appear below the map. Three-coin sets of the new Washington-Carver coins with mintages of roughly 8,000-12,000 pieces were produced every year from 1951 through 1954, with additional large quantities struck of the 1951(P), 1952(P), 1953-S and 1954-S coins for sale as singles. As the program expired in 1954 it drew few mourners. American coin collectors were bored with commemorative coins in general and with the serial ones in particular. The Booker T. Washington and Washington-Carver Halves were among the least desired at that time, and many thousands were returned to the Mint for melting, while thousands more were sold to speculators at just pennies above face value by the banks holding them as collateral.